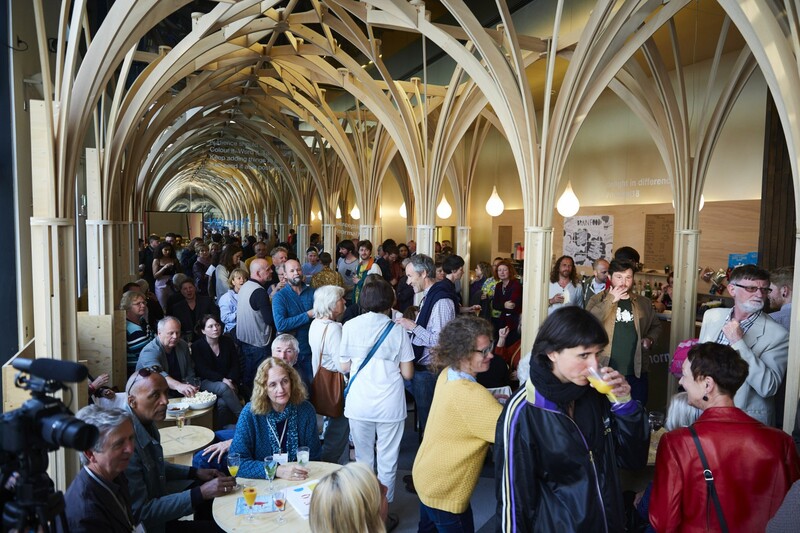 The Clearing is home to our café bar, located on the first floor. It is an immersive and sensory experience, created with vertical gothic tree-like forms by multidisciplinary architectural practice, Studio Ben Allen. Spacious and bright, the cafe bar is opened up and given the illusion of cathedral-like expanse, with floor to ceiling mirrors and windows. Having hosted a variety of events in the space, including parties, corporate events, book signings, music events, talks and workshops, it is an ideal place for any occasion. With a 1000 watt speaker system available, the bar is included in evening hires of the auditorium, or auditorium hires that require a space for the provision of catering. However, it can also be hired as a standalone space. Enjoy a delicious menu of paninis, soups and cakes, handmade by local suppliers. We also have a range of reasonably priced bottled and draught beers available, as well as spirits, wines and ciders and we can stock additional brands for any specific requirements.